The scientific literature and vendor advertisements are full of reports and examples of success stories of techniques and methods, but their limitations and shortcomings are not reported for obvious reasons. One such technique is tandem mass-spectrometry, or MS-MS, as vendors seldom describe, explain or demonstrate the technique's limits and most importantly – why and how it fails. In GC-MS there are at least five ways to increase the detection selectivity against matrix interference and improve sample identification and quantification: a) MS-MS; b) GCxGC (or GC-GC); c) High resolution MS such as TOF; d) A selective ion source such as NCI, and; e) Having enhanced molecular ions which are far more selective than lower mass fragments. In another post in this blog we discussed the unique selectivity of the molecular ions which is much higher than that of any fragment ion. Better understanding of the selectivity enhancement factors of these methods and their performance aspect trade-offs is important for any decision about which system to purchase and optimally use. The short answer to the question asked in the title of this post is that MS-MS fails when the selectivity improvement is offset by too large signal loss. Keep reading to find out how and why does the MS-MS technique fails (with examples), the reasons for MS-MS signal loss and the factors that affect its selectivity in order to better understand its advantages and limitations. MS-MS is a powerful technique which reduces matrix interferences. However, it has its limits. Our experience with MS-MS is that it is applicable only for about 90-95% of all sample compounds and not for 100% of them, and the average MS-MS selectivity (matrix interference reduction) improvement factor in GC-MS-MS is ~20. There is a physical basis for this selectivity factor of ~20. In a typical GC-MS-MS application, such as pesticide analysis, average pesticide molecular ions are about 300 Daltons but most often the molecular ions are low in abundance and therefore are not used as the MS-MS parent ions. As a result, the highly abundant high mass fragments, with approximate m/z of ~200, are selected (unfortunately) as the parent ion for MS-MS. In addition, low mass daughter ions with m/z<50 are not detected as they are mostly lost in Q2. Thus, under random statistical behavior the MS-MS daughter ions can span the range of 150 amu hence the selectivity (one over its probability to coincide with matrix daughter ion) could approach 150 (with unit resolution MS). However, four major factors further restrict the MS-MS selectivity including: A) The parent ions dissociate into several fragments, typically two-five and so are the matrix ions. Thus, if we assume three daughter ions, the typical statistical selectivity will be reduced from 150 into 50: B) Zone of silent masses; many and even most masses can not be observed in MS-MS as they are in a silent zone of practically impossible fragment masses. For example, the parent ion can lose a hydrogen atom or two but not three or more (energetic considerations), and in standard organic compounds the next possible loss is of a methyl group or nitrogen atom or OH etc. radicals thus a loss of >13 amu. As a result, the mass window of parent minus 3-12 amu is in the "zone of silence" and several such windows exist which restrict the selectivity; C) The various isobaric parent ions that co-elute in GC-MS typically have some mass correlations in their elemental formula such as the replacement of CH2 by N atom or NH2 by O atom etc. Consequently, the probability of having a common fragment with a different isobaric parent ion is higher than expected based on random statistics. D) In cases when the selected parent ion is not the lowest mass isotopomer (such as with poly-chlorinated pesticides) but the most abundant one, there are also few isotopomeric daughter ions. On the other hand, the selected CID voltage improves the MS-MS selectivity since different isobaric compounds can have different optimal CID voltage. As a result of the above, simulation with NIST library and our experience, the overall selectivity gain is only about a factor of 8 and in consideration of different optimal CID voltages it is increased to 20 and this number is also supported by our experience with MS-MS.
MS-MS fails when the selectivity improvement is offset by too large signal loss. Thus, according to our MS-MS failure criterion, when the selectivity gain is smaller than the square root of the MS-MS signal loss, the baseline relative statistical noise will grow and more than offset the gain in selectivity. For example, if the MS-MS selectivity gain is a factor of 5 while the signal loss is a factor of 100, according to our criterion MS-MS fails as 5 is lower than √100=10 and SIM on the parent ion should be preferred. The two examples in Figure 1 below demonstrate this point. 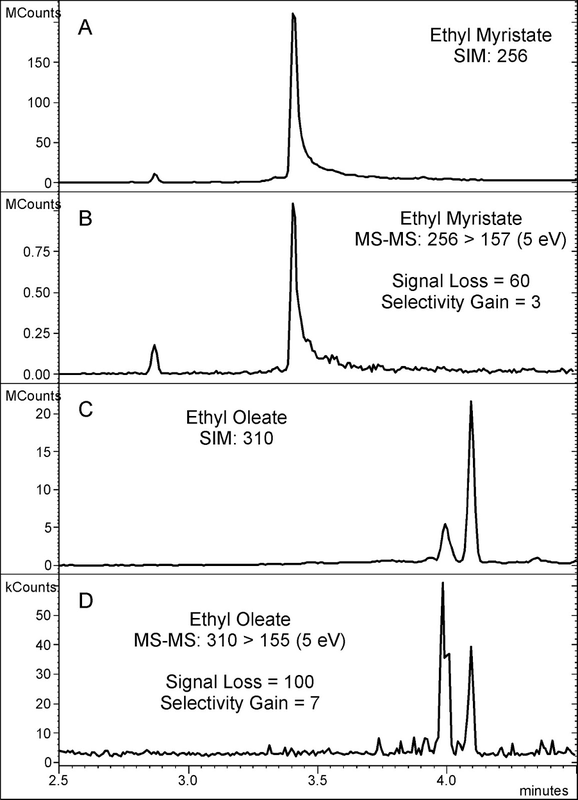 In Figure 1 we show that the Ethyl Myristate (upper two traces left side peaks) and Ethyl Oleate peaks (bottom two traces left side peaks) are relatively higher with MS-MS than in the SIM traces in comparison with the matrix peaks (right side peaks). However, due to large signal loss, as indicated in the figure, their baseline noise is higher as well, thus in our opinion (according to our criterion as above) the SIM trace is better than the MS-MS trace for their analysis and quantitation due to its superior S/N. Q3 transmission losses. Q3 transmission at standard calibrated resolution is only 25-30% hence Q3 reduces the signal by a factor of 3-4. Q2 CID losses. These Q2 losses are due to the fact that the target daughter ion is accompanied by other daughter ions as well as residual parent ion. This loss factor is compound dependent and can be approximated as 3. Q2 retaining losses. Additional Q2 losses are due to daughter ions losses via non unit Q2 RF field retaining (transmission) of these ions. We can assume a compound dependent loss factor of 1-2 (could be higher at lower masses). Q2 collimation lenses losses. In comparison with a GC-MS with a single quadrupole the addition of Q2 results in ion transmission losses at the Q2 entrance and exit lenses. These lenses are narrower in Q2 than the entrance lens in a single quadrupole MS as they are designed to reduce the Q2 CID gas load on the pump. This loss factor is estimated at about 3, depending on the design, but it can not be measured in a given GC-MS-MS system since it requires two separate systems for its measurement. When these factors are combined we obtain an average MS-MS signal loss factor of about or more than 10. On the other hand, MS-MS improves the selectivity by a factor of about 20 as discussed above. Accordingly, MS-MS is involved with an average signal loss factor of 10, matrix signal reduction factor of 200, and selectivity improvement factor of 20. However, in MS-MS we have fewer ions for the target signal and much less for the rejected matrix ions. Such a reduction in number of ions inevitably leads into having poorer ion statistics of both the signal and particularly the matrix which adversely affects the LOD that is obtained by MS-MS. Since MS-MS is involved with a signal loss of about 10, its ion statistical noise is increased by the square root of 10 which is about 3. Thus, while the MS-MS selectivity gain is ~20, the LOD gain is conjectured by us to be only about 7 and we, like others, can generalize it in claiming that MS-MS lowers the LOD in analysis in complex matrices by an order of magnitude. In conclusion: we estimate that MS-MS brings with it a signal loss factor of 10 and matrix loss factor of 200 which represents a selectivity gain factor of 20. However, when the effect of signal loss on the LOD is considered the MS-MS improvement of the LOD is estimated by us as a factor of 10. Clearly, these numbers are compound dependent and in some cases the signal loss is large and the selectivity gain is low. Furthermore, our use of the criterion of MS-MS failure, which is when the square root of the signal loss is higher than the selectivity gain, is subjective and not statistically rigorous. (In this discussion we avoid the treatment of the second MS-MS and SIM ions.) For example, if the signal is reduced by a factor of 10 and the matrix is in the form of chromatographic peaks that are reduced by a factor of 200 than the LOD is improved by a factor of 20. However, if the matrix is represented by a smooth hump which is reduced by a factor of 200, its fluctuations are reduced only by a factor of square root of 200 which is 14 and the LOD is improved only by a factor of 1.4 instead of 20. Furthermore, if the signal is weak, its reduction by a factor of 10 could lead into "not detected" and thus MS-MS failure. Our generalized claim is that MS-MS fails when its generated daughter ion signal to noise ratio is inferior to SIM on the parent ion. In SIM the matrix rejection is poorer but the SIM trace stability could be so much better than in MS-MS that it is preferable. What are your thoughts on the topic? Is it fair to claim that MS-MS fails when the selectivity improvement squared is lower than the loss of signal since in that case the baseline relative statistical noise more than offsets the gain in selectivity?. Figure 1. A comparison of MS-MS and SIM mass chromatogram of fatty acids ethyl esters in hair using GC-MS(-MS) with Cold EI. Trace A shows the SIM mass chromatogram of Ethyl Myristate that should be compared with its MS-MS mass chromatogram trace B in which the sample signal is lower by a factor of 60 while the noise is lower by a factor of 180 (selectivity gain factor of 3). Similar example is shown for Ethyl Oleate in hair in traces C and D in which the signal loss is 100 while the selectivity gain is 7.
very useful for anyone involved in real world applications!